Southern Bluefin Tuna are long-lived, fast-moving fish, migratory fish found throughout most of the southern temperate oceans. They can live to 40 years, grow to over 2.0 metres in length and over 220 kilograms in weight. They are known to dive to at least 500 metres. Orange roughy inhabit depths between 700m and at least 1500 m and are very slow-growing, long-lived fish, probably living up to 120 or 130 years. Little is known about orange roughy predators but they probably include many deep sea fish and sharks. These fish live at great depth and are very active and fast-moving compared to other species at the same depths, so they may be able to avoid many predators. The jewel squid’s left eye is always much larger than its right. In some species the left eye is telescopic while the smaller right eye is normal. Their name comes from the scattering of small glittering spots over the undersides of the body, head and arms like tiny car headlights. When the squid is hanging at a 45 ° angle, all these light organs aim down and produce just enough light to cancel out the silhouette of the squid against the weak light from the surface above. They can even adjust the lights for different depths or time of day. This is found in deep subtropical waters of all oceans, from depths of 500 to 2,000 m. Its length is between 10 and 30 cm. They are bioluminescent fishes, possessing rows of photophores along their sides, with which they hunt planktonic invertebrates, especially krill. The species occurs in temperate marine waters of the southern hemisphere, except off South America. In Australia it has been trawled from off New South Wales, Victoria, Tasmania, South Australia and Western Australia. The basketwork eel gets its name from the criss-cross pattern on their bodies visible when their skin is scraped off. They are generally scavengers eating the remains of dead fish and other marine animals that sink to the ocean floor. They have also been found to eat animals that may not have been dead when swallowed. Perhaps they found an old or sick animal or they may have just been lucky. Unless you can study these communities for many, many years you will never fully understand all the relationships. The firefly squid is a small member of the squid family. The tips of their tentacles are equipped with light-producing organs. The squid flashes these lights on and off to attract it prey. At night they move up towards the surface to search for food. The firefly squid is also capable of emitting light from its entire body from another set of light-producing organs. The Viperfish has large wide jaws with huge fang-like teeth. They can unhinge their upper jaw to allow them to swallow prey similar in size to themselves. The sides of its body are covered with coloured areas, each with one or more small light-producing organs. During the day they are found in deep water but at night these fish swim up into water less than 600m depth where there is more food. Smooth oreos, like the Orange roughy, are caught commercially by deepsea trawling. They are usually found at depths of 600m to around 1500m. Juvenile Smooth oreos live near the surface for up to six years before they migrate to the depths where they remain. Like the Orange roughy they are much more active than most fish found at these depths. The lantern fish is another deep-sea fish that has small light-producing organs on the underside of their body. Special cells that glow with a green light make the light. Predatory fish swimming below them find it difficult to see their glowing bodies looking into the light above. These small lobsters are one of the strangest lobster groups. They live on the seafloor from hundreds to thousands of metres deep. At the se depths is no light and, like many other animals that live in the dark, they have lost their sense of vision. Small spines are found where the eyes would normally be. The front pair of legs is like long, fine tweezers, and may be used to locate and capture food. When they hatch they join the deep-sea plankton before changing into a small spherical juvenile form. They look so different from the adults that in the 1800’s they were thought to be different type of crustacean in their own family. Salps are small animals related to the sea squirts. This group is more closely related to humans than any other invertebrate group although they closely resemble jellyfish. Salps are jelly-like, almost transparent barrel-shaped marine animals that live in the plankton. They vary in size from a few millimetres at their birth and grow up to about 10cm. Salps filter food particles from seawater by pumping it in from the mouth and out through the rear opening using muscle contractions. This pumping action causes the salp to move forward so they swim and feed at the same time. Salps are the main diet of several fish species, but have also been found in the stomach of albatross and seals especially when other food sources are scarce. These shrimp belong to the group of crustaceans known as the Carids. There are many species of Carid shrimp with a few even found in freshwater. Most shrimps are scavengers but others are active predators. Shrimp are only one group of the Crustaceans. Crustaceans, from microscopic forms found in plankton to large crabs and crays, are one of the most important and abundant groups of animals in the sea. Plankton Plankton are small organisms (animals and plants) found living in all water bodies from freshwater to salty. They drift with the currents, as most have no organs for movement. Zooplankton (the animal forms of plankton) contains small crustaceans, single-celled animals like protozoans, and the larval stages of larger organisms, while phytoplankton (the plant forms of plankton) are mainly diatoms. 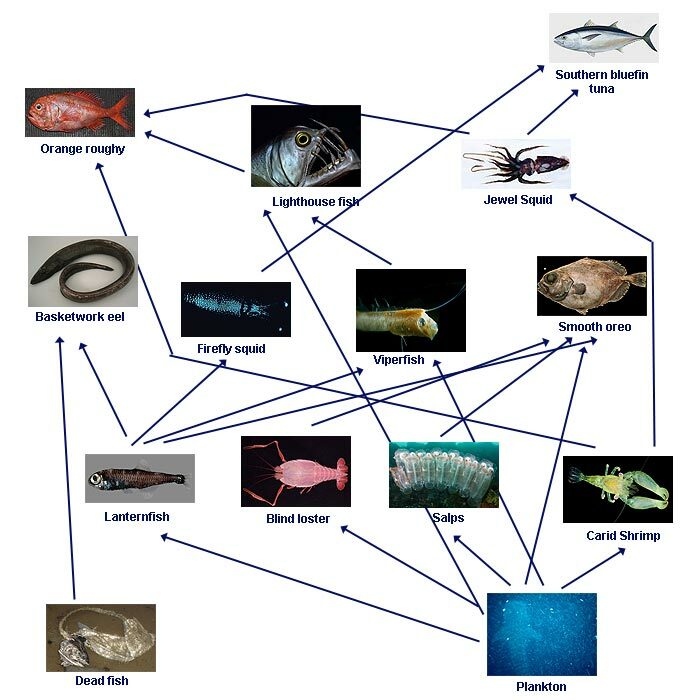 Plankton form the lower link in most marine food chains. The Phytoplankton use energy from the sun to produce food through photosynthesis, then they are eaten by Zooplankton which are eaten by small fish and so on up the food chain. Dead fish Larger marine animals will sink to the ocean floor when they die. There they provide food for scavengers, decomposers and other animals which feed of these organisms. Dead organisms from plankton and fragments of larger ones clump together and slowly sink taking nutrients to the ocean floor. Again many animals can obtain their energy from this “marine snow”.